Stagemaker hoists are possibly one of the most frequently used electric hoists in this industry. They are utilised in the majority of show-biz applications, from small theatres to stadium concerts. 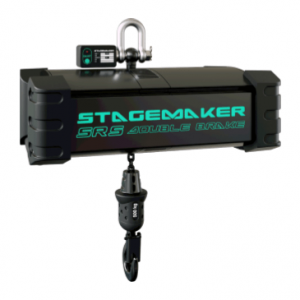 Stagemaker hoists have an enviable reputation, setting a high standard for the rest of the stage and tour equipment industry. Manufactured by Verlinde, a leading industrial electric hoist brand. Known for products of the highest quality and designed by cutting edge technology, Verlinde and Stagemaker are names you can trust. Safety and reliability are top of the agenda in all Stagemaker entertainment hoist systems. Available in a wide range of lifting capacities and working speeds to suit different applications. 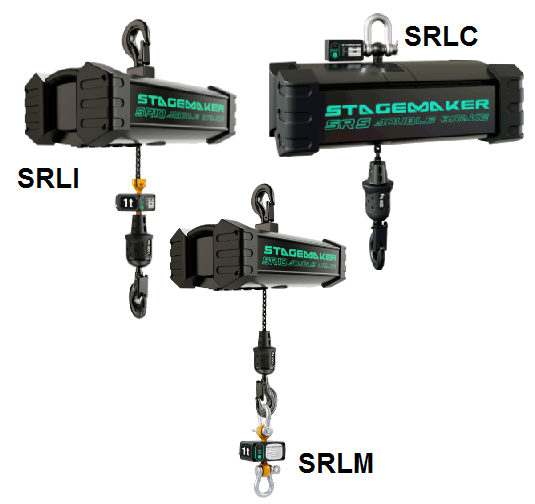 Lifting Hoists Direct can supply the older SM Stagemaker entertainment hoist along with the newest SR Stagemaker chain hoist model. The SR incorporates a superior double braking system as standard – safety you can rely on. The SR entertainment hoist comes in two versions. The standard industrial type operation and a climbing hoist operation to better suit the wide range of lifting and moving operations that are undertaken within this huge industry. 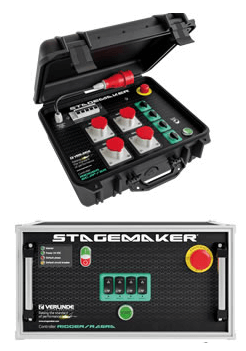 Alongside the Stagemaker chain hoist we can also supply a range of Stagemaker accessories to include a large range of flight type cases for easy transportation and storage. There are force gauges and/or load cells for load calculations. We can supply cabling and push button controllers as well as complete control panel systems. 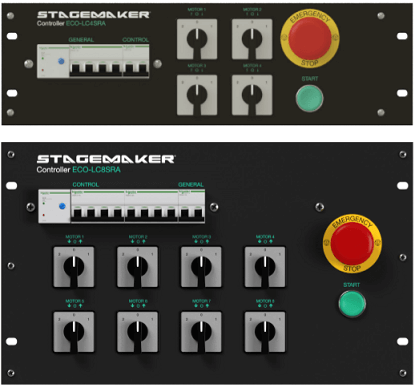 Stagemaker hoists controllers come with 4 or 8 channels enabling hoist control individually or in groups. Approved by official EU institutes, the controller conforms to all European electrical safety standards (IEC & EMC). 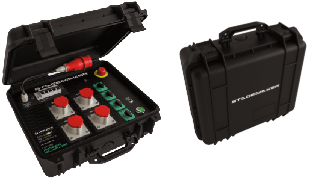 There is an additional range of controllers which can be used with the SM series. The R8 allows CPU connection to up to 8 units. These enable the pre-programming of the hoist or hoists to specific locations and heights and at specific times. What’s more the hoist or group of hoist can be stopped immediately from the controller with the emergency stop switch. The Eco pack is probably the most economical. 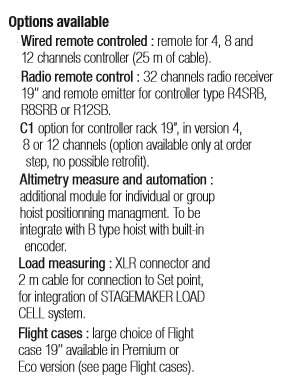 It consists of a steel case (4 or 8 channels) with direct control. Indicator lamp for phase monitoring. Multi connect outputs (for each group of 4 motors) power & control. Short circuit protection, thermal protection and a 32 A 5p CE power-in plug. The maximum power per channel is 1,8kW / 400v 3 Ph. Flight cases available. The Rigger control pack has a four channel direct control with a radio receiver for a radio load cell and a wired remote control unit. Key features include: phase detection with auto correct feature. Cabling for possible wired or wireless remote controller as standard. Standard master/slave function, multi connect output. Short circuit protection 1,8w /400 v 3 Ph maximum power per channel. 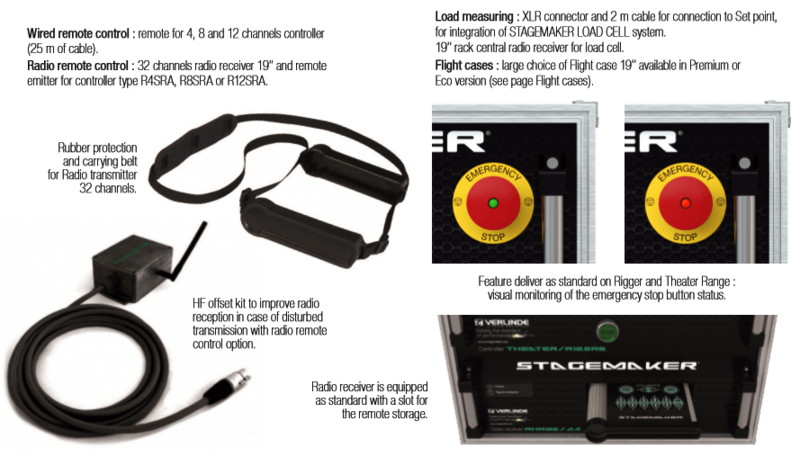 Load Cell Options for the Stagemaker Entertainment Hoist Range. This is a specialised system for measuring the weight of the load a Stagemaker chain hoist is holding. It also enables continual monitoring. They are totally wireless and each cell transmits with total independence thanks to the multiple channels available. This ensures there is no cross contamination of information between different loadcells. There are 3 models, the SRLI is a radio integrated load cell, fixed to the load chain. The SLRM has shackles to fit between the hook and load. The SRLC radio load cell is fixed to the top suspension hook. 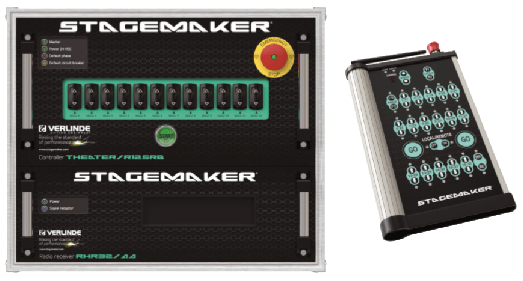 If you require more information about our Stagemaker hoists, do not hesitate to give us a call.